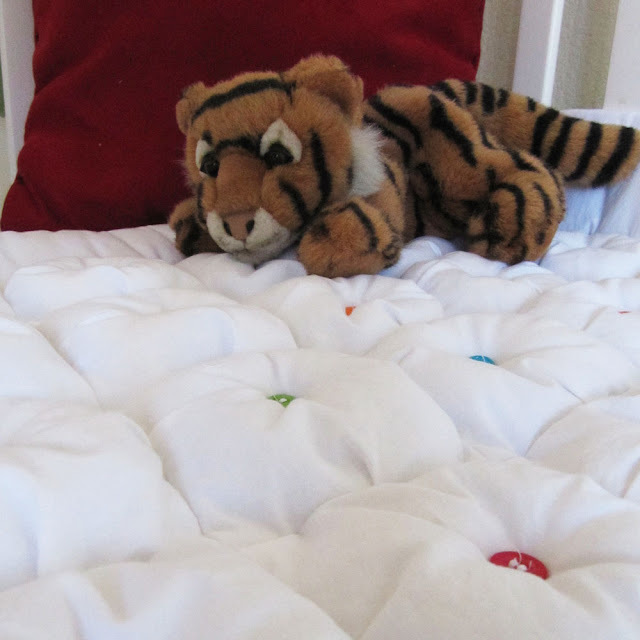 Puff Quilt Giveaway on Tatertots and Jello! UPDATE: IF THIS QUILT IS FOR A BABY, DON’T SEW BUTTONS ON. YOU CAN USE FELT BUTTONS OR COLORED EMBROIDERY THREAD INSTEAD. THE BUTTONS ARE A CHOKING HAZARD AND I DIDN’T GIVE THIS QUILT AWAY. It was me versus the clock this week. I had my Round 4 craft for Crafting with the Stars (which by the way you need to go VOTE FOR, it’s the final round!!) as well as getting a new puff quilt design done for my giveaway. Wanna see what you could win? So simple. White. Buttons. Minky on the back. That’s it! This little tiger loves to cuddle with it. Another gender neutral quilt design…I love it. 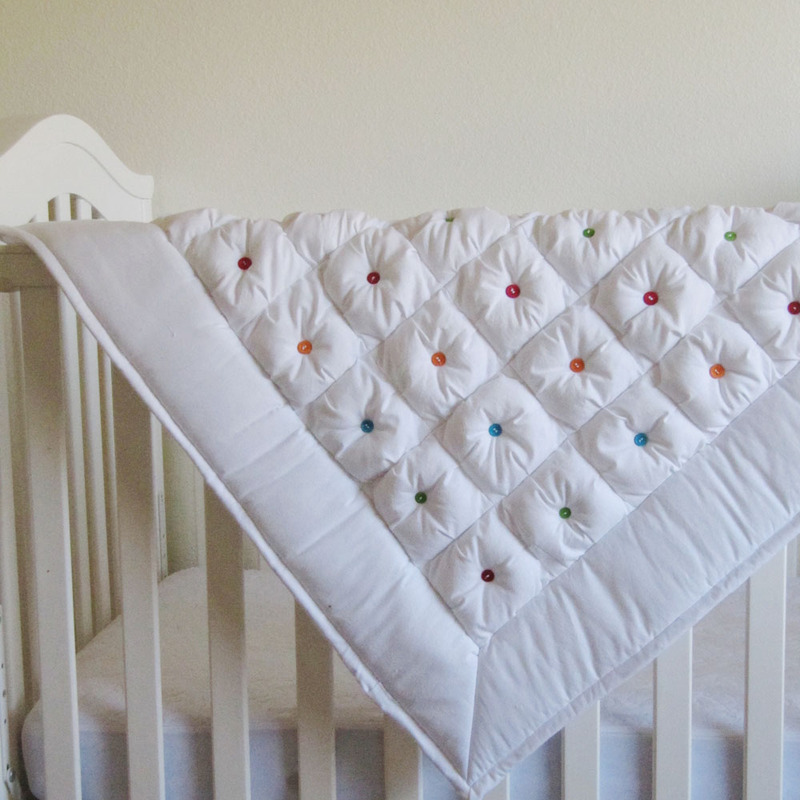 These quilts should be able to be used for every baby! You don’t like the colors of the buttons? I can change them to coordinate with your color scheme or even just white or black. Visit Tatertots and Jello to enter this giveaway and “Hard Candy” can be yours!! Be My Guest! Submit Your Tutorial Here!! Share Your Holiday Traditions Here!! LOVE this one, too! And your tag is SO CUTE!!! Love your shop! just came over from Tatertots & Jello. 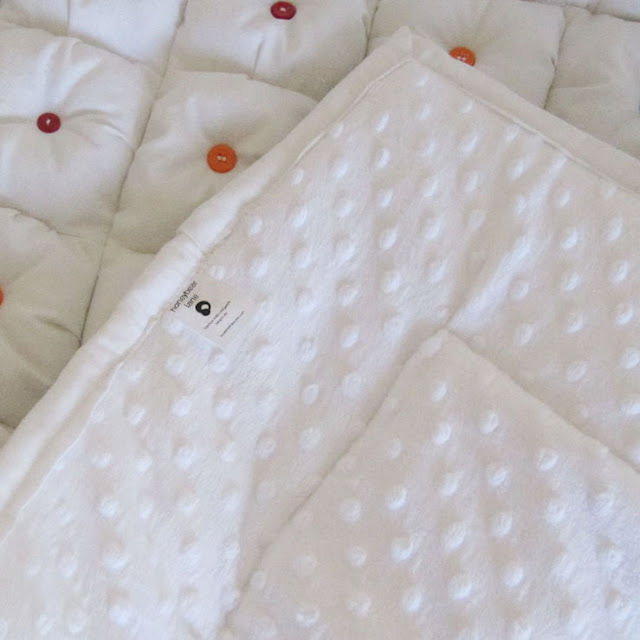 I love the hard candy quilt it's great. Do you do custom orders ? Oh my goodness, you are REALLY talented!!! I love your shop and those quilts are darling! I just saw this blanket as a giveaway on Tatertots and Jello, and I must say everything you make is so beautiful. This is beautiful – I love this quilt!! What a great idea and super name. 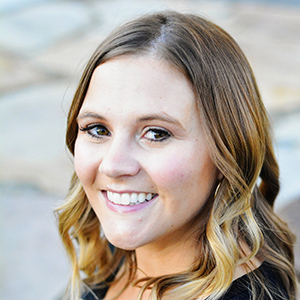 Please enter me to win!! Our computer woudnt let me enter at Tatertots & Jello. Forgive me if I did this twice; didn't get the proper confirmation on the first go 'round. I am so happy to have found your blog. That Hard Candy Quilt is magnificent! Your quilt is beautiful! I would love to learn how to make a quilt like that. I'd love even more to have it!! I Love your work!!! You are so talented!! Wish I had that kind of talent! 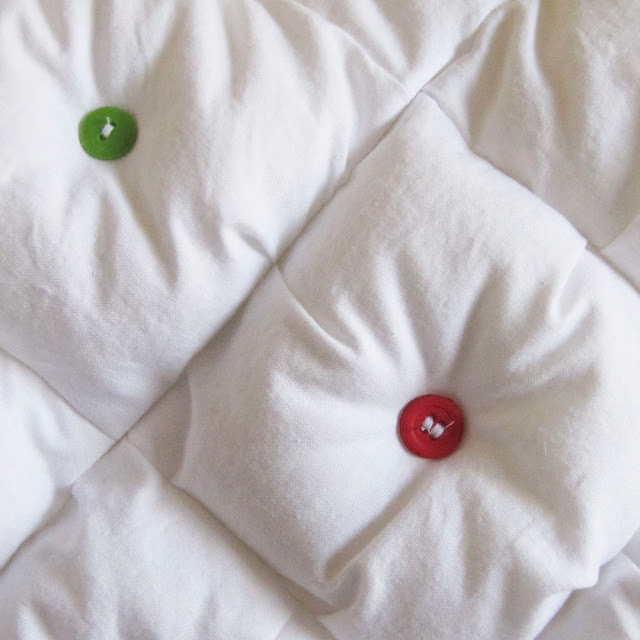 Very cute but your child's reaction should be a give away that these buttons should be big enough to pass the choke hazard test especially if the quilt will be given to a wee one. Good news! I'm sure your buttons are put on much more tightly than all the Chinese-sewn buttons that are on all the many many many children's clothes which place buttons right up next to wee one's mouths. It is a gorgeous blanket. Completely appropriate for a baby. Beautifully done. I wouldn’t allow this near my kid unsupervised. Buttons are a very large choking hazard, and I don’t want anyone’s kid to die because of this. I hope that whoever got it cut all the buttons off before using it for bedding. 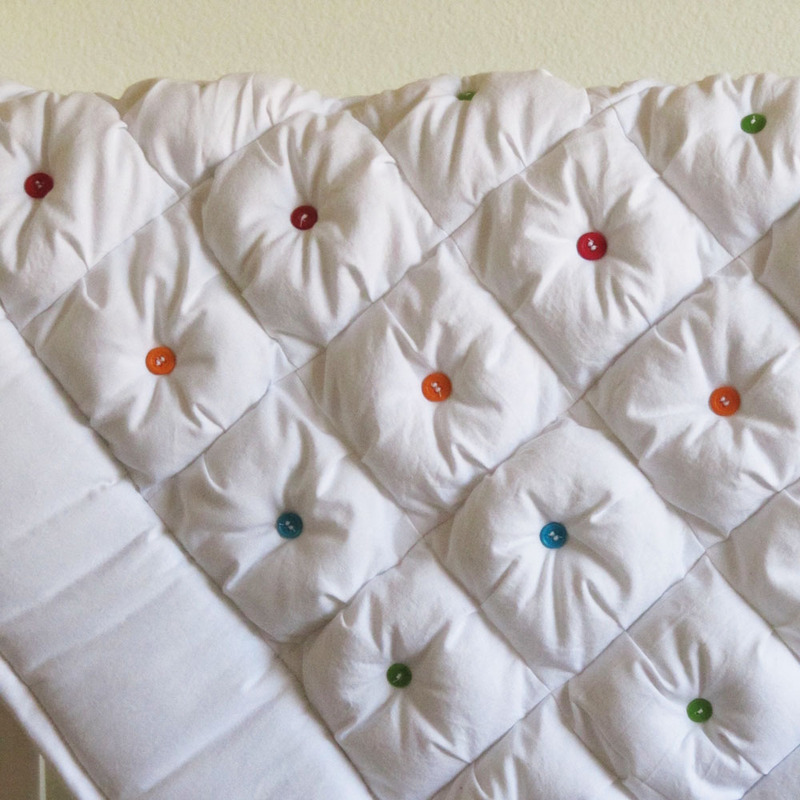 This is a very old post and after the giveaway I decided to send out a different quilt and discontinue the button quilt. But it’s still fun to look at! I love the button comforter, beautiful, unique, however, I would NEVER give it to a baby no matter how well the buttons are sewn on. I one made a doll with button eyes that were sewn on with carpet thread very well; guess what the little one picked at them till they came off. Now I always use felt or other heavy fabric. I discontinued this blanket, I never sold it to anyone. Hi there, I am trying to make a beatrix potter quilt, and I had a complete different idea in mind until I seen this quilt! Very neat! I was wondering if you would mind sharing how to make puffs? Is it a complicated thing to do? I’ve been trying to look it up online, but your puffs look different from theres. Any pointers would be greatly appreciated! I wrote a tutorial that you can purchase in my shop. Heidi- it’s really to bad you had to stop making the quilt. I’m going to try one and use 2″ buttons and see how they work. You have absolutely amazing designs! Just ran across your pretty, puffy baby quilt and it reminded me of a similar one that my mother made for my daughter when she was a teenager. She did not make a puffy quilt but she made hers a comforter, like the ones that had to be tied. Instead of tying, she used buttons, and these buttons came from 6 generations of women in our family – all the way back to my great, great grandmother to my daughter who is now going to be 40. It is one of her biggest treasures that mom made for her. Thanks for letting me remember for a moment and then let me ramble.